It is hard to believe that every morning as the Metropolitan Atlanta wakes up to go to work and school that Atlanta Municipal and County leaders are looking for over 600 million gallons of water. This water is needed to run schools, supply homes, and meet the needs of business, industry and hospitals. 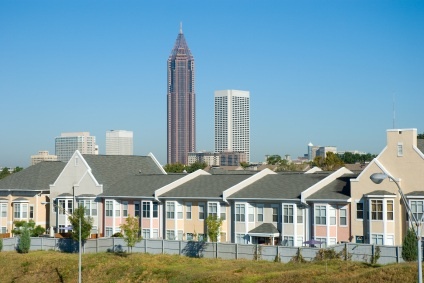 Over the past 20 years The Atlanta Metropolitan area is one of the fastest growing metropolitan areas in the U.S. The population has more than quadrupled from the one million residents to now more than 6.7 million. According to the Atlanta Journal Constitution, the 28 county region has been ranked as high as number two in the U.S. in total population growth behind the Dallas Fort Worth area. From 1998 to 2005, the Atlanta region has added almost one million people. The Atlanta 16 county Metropolitan area consumes almost 662 million gallons (MGD) every single day.The Etowah River/Lake Allatoona and the Chattahoochee River/Lake Lanier provide 84% of the regional total water supply. With 16 different counties and countless municipalities, it is going to be impossible to develop a consistent water policy to handle the problem for the entire region. We currently have all the water this region will ever have. The foundation for the problem was established when the city of Atlanta began back in the 1800’s. Unlike most major cities in the U.S. that were formed on large rivers or as ocean ports on the coast, Atlanta was founded at the intersection of two railroads. Though our region averages over 50 inches of rainfall each year, our rivers and streams are limited with different drainage basins that limit the formation of a single sustainable body of water with enough water volume. In fact, Atlanta is one of the largest cities in the U.S. with the smallest drainage basin. During the 1950’s, Lake Lanier was built and the Northside Atlanta began to boom as the city marched northward with development of Cobb, North Fulton and Gwinnett counties. During the early 70’s and 80’s these communities became suburban hotbeds for single family, multifamily, commercial and industrial growth. The formation of one of the nation’s most efficient interstate highway systems along with the growth of Hartsfield Jackson airport have created a megalopolis with almost no boundaries for growth. During the 1980’s Gwinnett and Fulton counties experienced growing pains from lack of sanitary sewer capacity, yet no one forecasted the region would one-day face potable water challenges. It’s hard to believe that a generation of developers that have been concerned about sewer taps could soon become more concerned about water meters. The very next day the problem continues, as Metropolitan Atlanta wakes up to go to work and school and Atlanta Municipal and County leaders are looking for over 600 million gallons of water. This water is needed to run schools, supply homes, and meet the needs of business, industry and hospitals.